I have a theory about movies and the critics who review them. Sometimes I think critics get together as a group, grab some lunch and collectively agree whether or not to give a positive or negative review to a specific film. That’s the biggest thing I took away from 2013’s “Drinking Buddies”, currently rocking an 82% from critics (that’s good) at Rotten Tomatoes but only a 56% from audiences (strictly mediocre) and 6.2 at IMDB (a “Meh” if there ever was). Which one is it? Critical darling or audience dud? 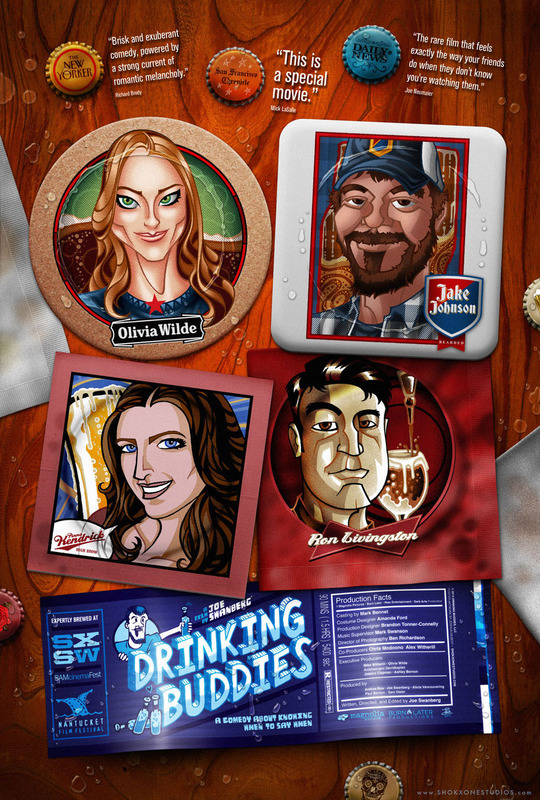 Working at Revolution Brewery in Chicago, Kate (Olivia Wilde) and Luke (Jake Johnson) are the best of friends. They hang out together, go drinking after work, bust each other almost non-stop about…well, everything and more importantly trust the other one about just about everything. Their friendly(ish) flirting goes on almost non-stop as well, but there’s a problem. Both are in relationships, Kate dating Chris (Ron Livingston), who signs promising artists for a record label while Luke is quasi-engaged to Jill (Anna Kendrick) as the couple figures things out for the future. Could anything come of their friendship like the perfectly compatible Kate and Luke deciding they should date and be together? Or will their significant others in their relationships end up being ‘the one’? I don’t know if I’ve ever written a more clichéd plot description than that. I remember watching the trailer for this gem at some point late last summer, the thought that maybe it would be good, and then…it just wasn’t. If you’re looking to save 90 minutes of your life, just watch the trailer. It hits seemingly all the necessary plot points and then ends. Wanna know the catch? That’s the entire movie. It doesn’t get any better than that. The entire movie is based on the 1990s TV sitcom cliché that Pretty Girl A is meant to be with Quirky but Perfect Guy A. The problem? Pretty Girl A is with Quirky but Not Perfect Guy B. Quirky but Perfect Guy A….yeah, he’s all over the place. I didn’t like this movie, and I was real close to completely bailing late in the 90-minute flick. For you loyal readers, I stuck with it though. If I’m going to criticize, I’ve got to have it all figured out, right? I watched this movie from director and writer Joe Swanberg and couldn’t quite put my finger on it. Just about each and every scene had this weird tone to it, an uncomfortable back and forth, silences that are too long for their own good. These are conversations and dialogue that just seem, well, forced. Why is that exactly? The entire movie was improvised. Yes, Swanberg provided a rough outline for his cast to work off of, but nothing definite in terms of actual lines. Instead, the cast just went with it, making up dialogue as they want. You know what? It shows. Beyond any reality of the awkwardness of male/female relationships, there are too many scenes that are just uncomfortable to watch. They’re either too short or gone on for too long. There is little to no rhythm from scene to scene, slowing down an already glacial-like pacing. There is talent here though so there has to be something worth recommending, right? Nope, Swanberg’s outlined script making it really hard to be sympathetic with any of the four main characters. We know basically from the start that Kate and Chris aren’t going to make it, and that Luke and Jill similarly have some pretty serious issues to deal with if their relationship is going to last. Maybe it is the entire lack of a script — just that lovely outline — or just the acting in general, but I didn’t like any of the four main characters. Wilde’s Kate seems too dumb and goofy for her own good, Johnson’s Luke is too nice and equally clueless, Livingston’s Chris is just odd, always off a beat or two, and Kendrick’s Jill is very twitchy and awkward and uncomfortable. The issues they’re dealing with, their emotions and relationship struggles are all pretty real, not some contrived movie relationship issue, but the characters range from dumb to annoying to unpleasant and the story never brings any of it to life. ‘Buddies’ does take some interesting twists about the halfway point, but by then I was almost completely checked out. It had already dug its grave way too deep by that point. It ends on a disappointing note, not resolving much and leaving too many plates spinning all at one time. And then for a couple other things worth mentioning. Jason Sudeikis (Wilde’s off-screen husband) is the only other supporting part worth mentioning, Kate’s absent-minded boss who tries to avoid work at all costs. Also, the film is set in Chicago, featuring references from everything to Revolution Brewery to random mentions of streets, schools and suburbs in the area. All well and good, right? Yeah, especially for Chicago viewers. It’s all a cop-out I tells ya!!!! We never see Chicago in the least. 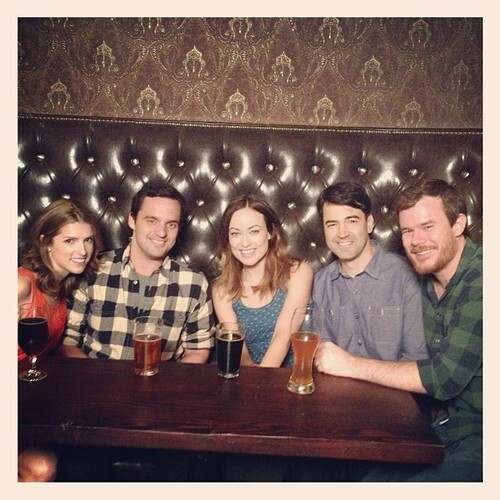 What a city tease, “Drinking Buddies”, for shame. A movie about late 20-somethings dealing with the hell that can be life (and set in Chicago) sounded moderately appealing even if the trailer was less than convincing. Nothing comes of it, the lack of a script being the biggest impediment to anything good as a finished product. 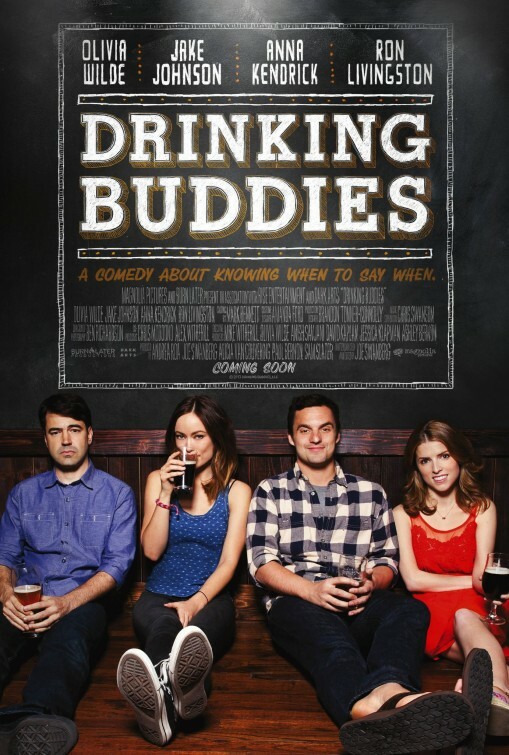 It’s called “Drinking Buddies”, and that’s what we see, four people drinking a lot of beer (and some wine), brooding over their relationships, flirting with their friends, and in general, being pretty annoying. Steer clear, just go to a local bar and people watch. It’ll be more entertaining.